The “Cascade of Caramel” drip cake is made with three layers of delicious caramel cake, sandwiched and masked with a smooth caramel infused cream, and topped with a smooth caramel drip and lots of yummy caramel treats! 12 Servings per Cake Place in an air tight container and store in the fridge. 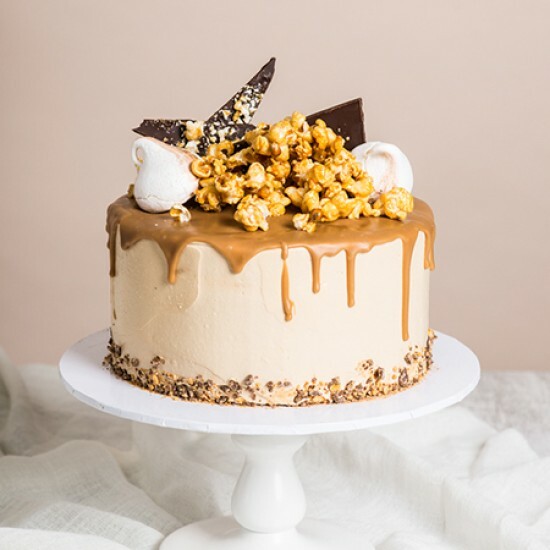 The “Cascade of Caramel” drip cake is made with three layers of delicious caramel cake, sandwiched and masked with a smooth caramel infused cream, and topped with a smooth caramel drip. Each cake is topped with a range of caramel decorations including caramel popcorn, meringues and hand made chocolate shards packed with caramel pieces with crushed honeycomb and chocolate at the base. Please note, product may differ from image depicted.